Charles Bridge Simulator is a casual 2D endless scroller game. Your goal is to get as far as you can while avoiding tourists. If you get stuck, it's game over. Tourists are simple creatures that follow few simple algorithms based on real life observations. Learn to distinguish between the types of tourists and you're safe. 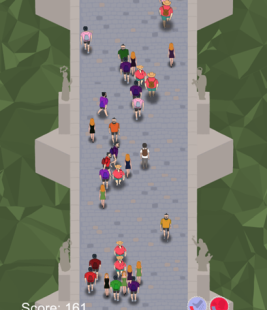 Use power-ups in a clever way to get around tourists. This game was created as a part of the Computer Games Development course at the Faculty of Mathematics and Physics at Charles University in Prague (MFF UK). We would like to thank to our teachers for providing us a platform to assemble the team and our mentor for his guidance. Charles Bridge Simulator is currently in playable prototype phase. We intend to continue developing this game. Stay tuned for updates!